Dynamics 365 CRM integration is available for Leadfeeder Premium and Trial users. To connect Dynamics 365 CRM you need Admin privileges for the Dynamics account. How do I connect Dynamics 365 with Leadfeeder? 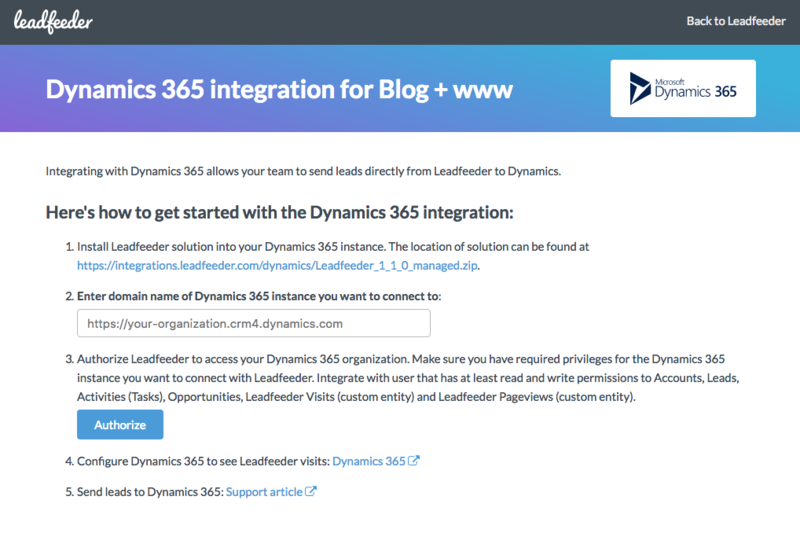 STEP 1: Go to integrations.leadfeeder.com and select the Leadfeeder account you want to connect to your Dynamics 365. STEP 2: In the following view click on Dynamics 365. STEP 3: You will be taken to our integrations page, which should look like the following page. Follow the instructions there. Once you've downloaded the solution package here, go to Settings > Solutions inside your Dynamics 365 CRM installation. Import the downloaded solution zip file as a solution by clicking on the import icon in the toolbar. Then click on the Choose File button and proceed to install the solution. Once you have connected your Microsoft Dynamics 365 CRM account to Leadfeeder, it's time to configure it a bit. The configuration is really easy and it allows you to see the all the information Leadfeeder sends to your Dynamics 365 account. Leadfeeder's integration introduces two new fields for Accounts, Leads and Opportunities: View in Leadfeeder and Latest Leadfeeder Visit. STEP 1: Go to any Account, Lead or Opportunity and choose Form from the menu. A form editor will appear. STEP 2: In the Field Explorer -> Custom Fields section on the right you will see two new fields: Latest Leadfeeder Visit and View in Leadfeeder. Drag and drop each field at a time to the Summary section. Once you have published all your changes and saved and closed the form editor, you will see the fields in their new location. STEP 3: Optionally add Leadfeeder visits table to Account or Lead forms. Go to any Account or Lead and choose Form from the menu. A form editor will appear. i) First create a new One Column tab below the Summary section and name it Leadfeeder visits. ii) Select the newly create tab and choose top-level menu Insert option and within it the Sub-Grid option. iii) Don’t forget to publish and save the changes once done with the details.